American's love Pop Culture and what better way to show your devotion for beloved film stars, tv shows and movies than with a poster to call your own? Choose from high quality glossy photos of your favorite stars to posters of feature films and much more. From Cult Classics to today's most popular	movies and tv shows you can decorate any space to become an array of Hollywood's best. 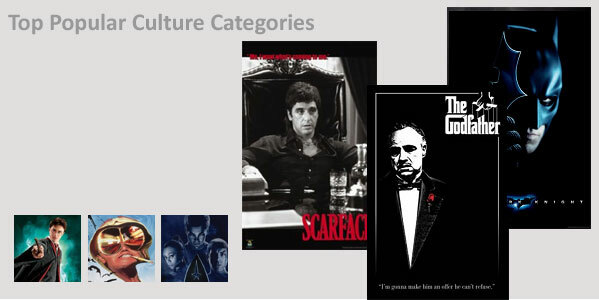 No matter what type of movie fan you are, we have a wide selection of movie genres to choose from. Whether it be teen angst or fighting for the universe, our collection of movie posters is sure to please even the most stubborn of movie critics. Television has allowed us to grow up with many of our favorite stars. Recapture some of your favorite childhood memories or hang up a poster of the latest TV craze with this fantastic collection of television posters. Music has a way of speaking to us like no other medium. In this collection you'll find some of music's most legendary bands and singers as well as today's latest artists. Custom framing is available for much of the over 6,000 music prints we offer. Flying Machine Takes to the Air!